During my time at the PlayStation Experience earlier this month. I got to play plenty of fun and interesting games, but Yonder: the Cloud Catcher Chronicles was easily one of the most beautiful at the event. Yonder is an open world adventure game set on the fictional island of Gamea, developed by Prideful Sloth, a small developer from Australia. Yonder’s bread and butter is exploration: when I took my first steps out of the cave where I began in the demo, the game panned out to show me the vast area that I could explore, as if it was asking me if I was up to the challenge of experiencing all the game has to offer. There is no combat in the game, but the point of the experience isn’t to defeat an enemy, but to go on an adventure and see what secrets this world is hiding from you. 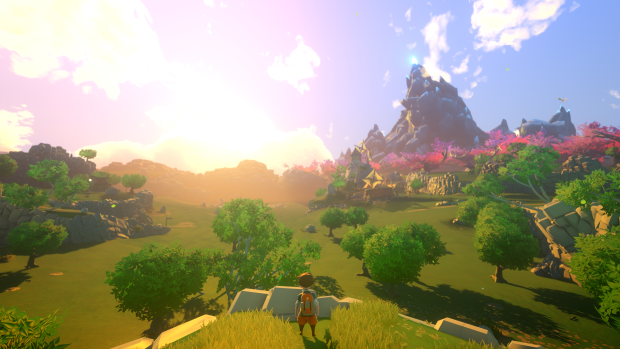 Crafting and trading are the main gameplay elements of Yonder. In Yonder,you use a Minecraft-like system of cutting down trees and smashing boulders which turn into wood and rocks, and then can be combined with other things to build houses or create items worth trading. There are plenty of traders throughout the game, and each will offer different set of goods usually related to the area that you are in. The world of Yonder was simply magnificent. I was immediately drawn in by the game’s Windwaker-esque style graphics, which looked amazing. The graphics do a great job of making everything seem to be so happy and full of life. All of the creatures that I got to encounter were just adorable, my favorite being the groffle, a cow-like moose creature that I got to turn into a pet and keep on my farm, which I completely loved. The lighting in the game was incredible. Everything from its dynamic day night cycle to smaller things like how your lantern’s light swings from side to side as you walk adds such depth to an already beautiful game. In order to progress, you need to clear murk from areas of the game. Murk is a dark cloud that covers buildings and structures or blocks your path. In order to clear the murk, you have to collect sprites, which are little creatures that are hidden throughout the world. Once you have obtained the correct number of sprites for a particular area, you can return to it and the sprites will remove the murk for you. This really adds to the immersive aspect of the adventure, since it seemed that an overarching goal was accomplished while I was crafting and trading. Speaking of goals, there is an overall story that can be experienced through questing. I didn’t see much of the main story during my short time with Yonder, but I did engage in a bunch of the game’s side quests. At one point, I got to fish for a side quest (and boy do I enjoy a good fishing mini game). I actually ended up losing sight of my goal and just fished for quite a while. This was probably one of the main reasons that I didn’t see that much of the main story. If you enjoy vast open-world games that have beautiful art and a fun system of crafting and trading(with the occasional fishing mini game), keep an eye out for Yonder: the Cloud Catcher Chronicles. Yonder: the Cloud Catcher Chronicles will be releasing on PS4 and PC in Q2 of 2017.